More Americans have smoke detectors than ever before, but nearly half of them don't work. Without a working smoke detector as an early warning device, fire can spread unnoticed through the household, blocking escape routes and filling rooms with deadly smoke. 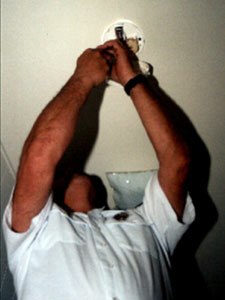 A working smoke detector can cut your chances of dying in a residential fire in half. Most fatal home fires occur at night when people are asleep. Contrary to popular belief, the smell of smoke may not wake a sleeping person. The poisonous gases and smoke produced by a fire can numb the senses quickly and put you into a deeper sleep. For best protection, a smoke detector should be located outside each sleeping area, with an additional smoke detector in each bedroom. For extra protection, install smoke detectors in dining rooms, furnace rooms, utility rooms, and hallways. Smoke detectors are not recommended for kitchens, bathrooms, or garages where cooking fumes, steam, or exhaust could set off false alarms. Because smoke rises, mount smoke detectors high on a wall or ceiling. Wall-mounted units should be mounted 4 to 12 inches from the ceiling. Ceiling mounted units should be positioned at least 6 inches from the nearest wall. Don't install a smoke detector too close to a window, door, or forced-air register where drafts could interfere with the unit's operation. Test your smoke detectors every month. Replace the batteries twice each year, when you change your clocks. Never "borrow" smoke detector batteries for other uses. Clean smoke detectors regularly according to the manufacturer's directions. 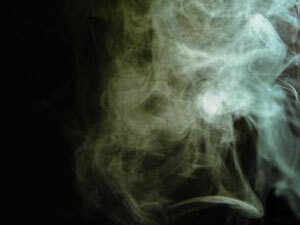 Dust and cobwebs can reduce a detector's sensitivity to smoke or cause false alarms. Be sure everyone sleeping in your home can hear your smoke detector alarms even with bedroom doors closed. Make sure that everyone in your household and all overnight guests know the sound of the detector's alarm and how to respond. Have a home fire escape plan so that everyone knows what to do when the smoke detector alarm sounds. Have two ways out of each room and a meeting place. Don't be confused! A carbon monoxide detector may look just like a smoke detector, but the two are different and they serve different purposes. Never replace a smoke detector with a carbon monoxide detector. A carbon monoxide detector might not provide the critical early warning or fire that a smoke detector will. Follow the manufacturer's installation directions for each type of unit to make sure that it will function properly. A carbon monoxide detector and your smoke detector might also sound alike. When shopping for a carbon monoxide detector, try to find one that sounds different from the smoke detectors you already own. Once installed, make sure all family members can tell the difference. If a smoke detector goes off, deadly smoke and flames could be filling your home. Leave the house immediately and call 9-1-1 from a neighbor's house. This information is provided by the Escondido Fire Department. For more information, please see the Carbon Monoxide Information Sheet or call 760-839-5400.